Have you ever wondered why your bike was shaking, pushing, tucking, chattering, losing traction, or won't turn? Perhaps you've crashed and it doesn't quite feel the same. 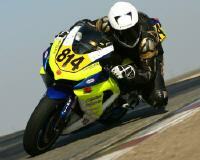 Race Tech has identified the need for bikes to be measured and has formed an alliance with Scheibner Ltd. of Germany! Using the most advanced technology in the motorcycle industry the Mega-M.A.X. precisely measures and analyzes the chassis' geometry and alignment. The Scheibner Mega-M.A.X. allows the technicians to optimize the motorcycle's chassis, steering geometry, swingarm and fork assemblies. Mega-M.A.X. 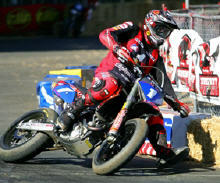 services are available for all types of motorcycles: Street, Dirt, Supermoto, Cruisers, H-D, not just road race bikes. Virtually all skill level riders can experience increased performance by utilizing Mega-M.A.X. technology. This is a vital, and often overlooked part of handling performance. Your bike can only ride to its full potential with the proper blend of Rake, Trail, Swingarm Angle, Wheelbase and a straight chassis! All types of bikes benefit from Scheibner Mega-M.A.X. analysis! Call 951.279.6655 to set up an appointment or send us an email.